With Summer in full swing, the time is ripe for teaching kids the magic and science involved in growing some of the delicious foods that they eat and Growums kits are the perfect way to do that! Growums' all inclusive kits offer children the opportunity to simply and successfully grow the ingredients necessary to create some of their favorite meals; while also educating them and bringing the fun in a big way! 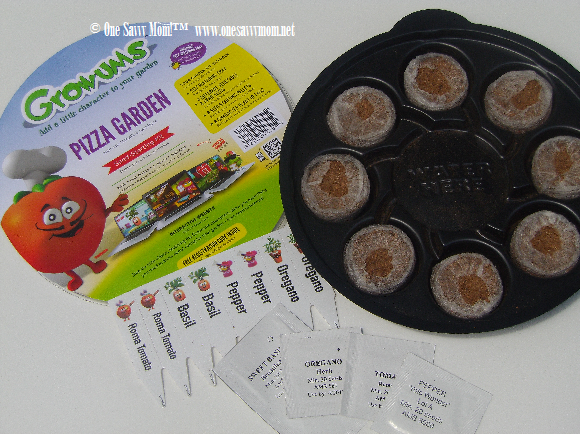 Each kit comes fully equipped with everything you need to get started (Pizza Garden contents pictured below), and by simply adding water to the center of the specially designed Growums tray the coco pellets expand quickly and are ready for your seeds. We love the specially designed Growums tray (pictured below), as it really takes the guess work out of watering! ﻿Keeping your plants perfectly hydrated is super simple with this tray and only requires that you add water to the center of the tray (best done with a measuring spoon). 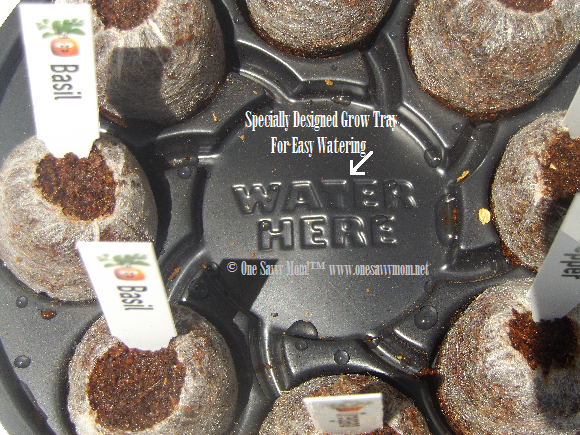 After you've added water to the center of the tray (pictured above) it funnels into each pod individually, dispensing the perfect amount to each plant. Following the entire process with the interactive Growums online site is a fun way to engage and teach kids the science behind the growth process! Each plant is brought to life as a delightful Growums character and each has their own page to explore with fun facts, free printable coloring pages, and free wallpaper downloads. Growums kits offer delicious possibilities, which best suits your family's tastes? The Taco Garden, Salad Garden, Pizza Garden, Ratatouille Garden, Herb Garden, Stir-fry Garden, or the Growums "Garden In A Box"? 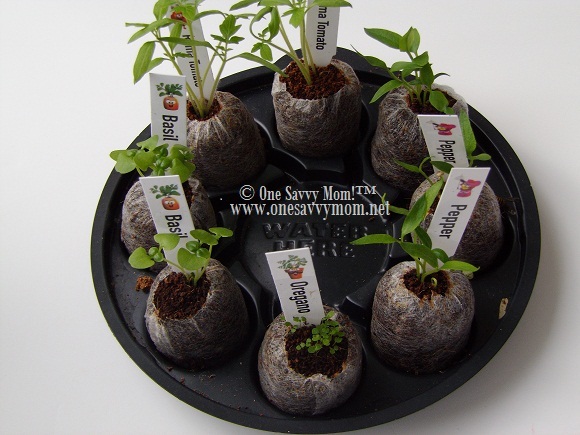 From seed to table, the entire family will delight in the interactive learning experience of Growums Garden Kits. Here at Growums, we feel that by providing children with a remarkable experience to grow their own garden – along with the help of fun characters who coach them in a fun online experience – the kids will be attentive and successful in their real-life gardening adventures. Our own kids have done it, and so can yours! And we can tell you from experience: The joy on their faces and the fun they had digging in the dirt – then eating what they grew – was immeasurable! Ready to experience the magic of Growums with your family? 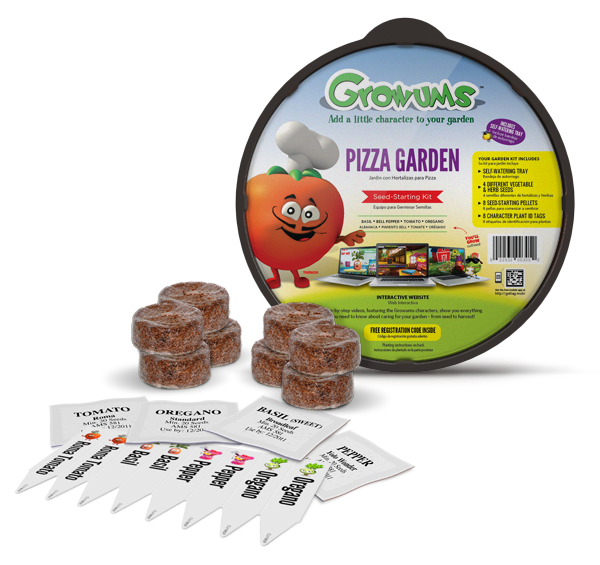 Three (3) One Savvy Mom Reader's will be chosen to receive a Growums Pizza Garden!